You can learn how to get rid of scars naturally and avoid harsh chemicals. Some natural ingredients can fade scars until they are hardly noticeable. It make take weeks or even months of consistent treatment to lighten old scars, so the sooner treatment is begun, the better the chances of eliminating the scar. Lemon juice is a tried and true remedy to fade scars. 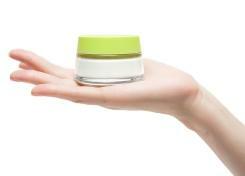 Add lemon juice to your current moisturizer or dab it directly onto the scar with a cotton ball. Apply the lemon juice twice a day, making sure to use a natural sunblock to ensure that the sun does not darken the scar. Cocoa butter is also worth trying to learn how to get rid of scars naturally. Like lemon juice, cocoa butter must be applied daily for its healing benefits. For years, pregnant women have used cocoa butter to eliminate stretch marks, and it works for scars as well. Like cocoa butter, Shea butter from West Africa is great at fading scars. Shea butter is usually sold in health food stores or in grocery stores that sell a large variety of whole foods and health food products. You can make your own natural whipped skin cream to reduce the appearance of scars. Get a container of Shea butter and add about two cups in a glass or plastic tub; it may be necessary to melt it in the sun to soften it. Heating it in a microwave or on the stove is faster, but may reduce the potency of the butter. Add about three gel capsules of vitamin E tablets. You can add more if you like. Add about two tablespoons of fresh lemon juice. Again, you can add more or less depending on your desired consistency. Whip the mixture using a hand-held mixer. Blend the mixture until it is creamy. The mixture is now ready to use. Keep it in an airtight glass container and use it twice a day. Although lemon juice is a natural preservative, keep your cream in the refrigerator so that it will stay fresh. Use a natural sun block to keep the lightening properties of this solution from being diminished by the sun.There are several other ingredients that you can find at home to reduce the appearance of scars. Cucumber juice can lighten scars, but like most natural products it must be applied consistently. If you have a vegetable juicer at home, try putting a cucumber in it and applying the juice to your mark a few times a day. Keep the juice in the refrigerator in a sealed container. Honey is sticky to use, but has some lightening properties to help fade scars. Add honey to your homemade cream or apply it directly to the skin. Vitamin E is also said to fade scars. Buy the gel tablets from any drugstore, pierce the tablets and rub the contents on the skin. You can also take the tablets to help promote internal health and skin health from the inside out. The above are some of the items that you can probably find around the house to fade unsightly scars. When attempting to get rid of scars naturally, remember that it takes time for natural ingredients to work. Use the products consistently and at least twice a day for the best results. Sunscreen or sun block must be used with these products or any commercial fade products. Even after the fading works, you need to continue to use sun block so that the sun does not thwart your efforts.